An American Soldier…A Memorial Day Story. 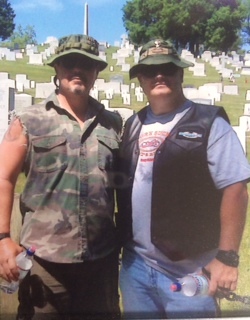 A few years back a friend of mine and I took the trek to Washington DC over the Memorial Day Holiday to participate in Rolling Thunder. If you don’t know about Rolling Thunder, its a gathering of Veterans on their motorcycles to honor fellow Veterans that served, still serving and keep the message alive that American POW’s are still unaccounted for. As a Veteran, I can personally attest to the reverence and emotional feeling being around over 500,000 people that have given so much, but recognized very little. We speak to each other with honor as we converse; whether a Veteran of Vietnam or the Middle East conflicts, we get it. My friend Steve Hughes earned a Bronze Star and had retired with over 20 years of service, however he was still carrying quite a bit in his “ruck sack” from his days in combat…I knew this particular trip among other Veterans would prove “freeing” in some ways that are hard to explain to those that have not walked the paths of combat. We loaded up our bikes and headed up I-81 with other Vets to DC for the weekend on a Friday before Memorial Day. Arriving on Friday afternoon, we explored some of the venues where events were to take place and just basically performing a “recon” of the area. On Saturday morning, we got up all excited for what the day would bring and headed out for breakfast. The particular restaurant we chose was full of Veterans…all wearing vests or hats with medals and patches that only fellow Vets recognize and know the meaning. As we finished our meal, we were walking out the door when a couple came up to us and asked “is this photo yours?” It was a photo of my oldest son Hunter in his Hargrave Military Academy uniform…it had fallen from my money clip. I thanked them, and they asked about the photo and uniform. I shared with them that Hunter is my oldest son and is a student at HMA. We continued to explain that the “Band of Brothers” was a connector of a high school football team to a combat unit overseas. The team made specific t-shirts that only we could wear (I was the team Chaplain)..but we also sent shirts to Steve’s unit in Iraq. Before we took the field for each game, I would provide the players motivation with a mixture of gospel and military talks…there is a direct correlation between battle, fighting for a cause with another, and a belief in something bigger than yourself. We prayed for Steve’s unit on their battlefield…on the other side of the world at the exact same time, members of Steve’s Infantry unit prayed for our team as we took to our “battlefield.” We finished our story with a few events of that experience including winning the State 4A football championship that year…and that Steve and I were there just to be together with other Veterans to honor and remember. I asked the couple if they lived locally and they responded no…they were from out of town and there to visit their son at Arlington. “Arlington” I asked, “is he stationed there?” “No” the mother said; “he is buried there.” With an immediate and almost convulsing rush of emotion, tears shot from my eyes…as they are right now as I write this story. “Our son was killed during a river crossing in 2003 while serving in Iraq…vehicles turned over and he died trying to save other soldiers.” Steve and I stood there crying…without any words we hugged and cried thanking these parents for their sons sacrifice for our freedom. They told us more about their boy and we completed our extemporaneous memorial service in the parking lot. I gave the mother the picture of my son Hunter and asked her to place his photo on the grave of their son..to honor him. The rest of the weekend seemed to be a blur of emotional conversations and sharing much of the past that only warriors understand. I share this real life event because Memorial Day is upon us…yes, it’s great to have a day off Monday going to the beach, cooking out, playing golf or just plain resting. But the day is really to remember sacrifices of those that gave their all for us. I dedicate this story and the song by Toby Keith below to the memory of Captain Chris Cash, a fellow NCMA graduate who gave his life June 24, 2004 for our Freedom. Take a few moments to listen to the words…the song was played at Chris’s funeral. When you see one of us this weekend wearing our uniform, hat, vest or shirt that you may not understand all the insignias, but clearly identifies the wearer as a Veteran…thank them. They probably have a story too. Happy Memorial Day…cheers y’all.